In the Azawak of West Africa, the method for obtaining water symbolizes a daily and constant struggle for survival. During the rainy season, people rely on muddy marshes to meet their needs for drinking, bathing, cooking and anything else one might need water for. You might call this time "the happy time" for this is when animals are producing milk, and therefore the people are thriving. However, this "joy" is not only short-lived, but quite relative to what a human being ought to expect for meeting their basic needs. First of all, children are often the ones who travel an hour on the back of a donkey just to reach a marsh. 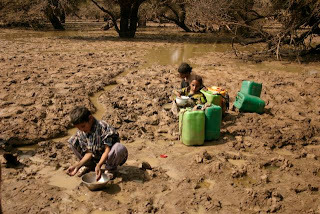 Once they arrive, the water they pour into their jerry cans from the marsh is contaminated with human and animal waste. Most importantly, as the rainy season comes to an end, the marshes dry up, and then there is no more water. Then, the real hardship begins. People travel as much as 35 miles in a day to reach the nearest deep well. These wells provide only relative relief. After a grueling ride across rough terrain on the back of a donkey, a person would most probably find a water source that has very little water, if any, after being exploited by 25, 000 people and animals. Further, it takes the strength of several strong men and three to four donkeys to fill the bucket and then pull it up from a depth of at least 300 feet deep. To aggravate the matter, the water that is retrieved is muddy and contaminated. This is a truly sad scenerio, and one that Amman Imman plans to remedy by drilling permanent water sources that access the abundant aquifers that flow beneath the Azawak.